What should you tip when everyone is watching? It sounds straight out of “Seinfeld” — the very definition of an awkward moment — but it’s real. But with the new mobile point-of-sale systems, a customer who’s not in the mood to tip needs to actively opt out — while facing the server across a narrow counter. At a time of increasing concern over the struggles of low-wage workers, and protests to hike the minimum wage, social pressure to be generous isn’t a bad thing, particularly for those who can afford, say, sustainably grown, naturally processed coffee that goes for $70 a pound. But it’s pressure all the same. A recent survey found that when the server is looking on, 41 percent of people are more likely to tip. An equal number said it would have no effect on their tipping, according to Software Advice , a Texas-based information technology firm. Eighteen percent said the server’s proximity would make them less likely to leave a tip. For better or worse, it’s also expanding the idea of what constitutes a tippable event — like picking up takeout. In the Innovation District, Dennis Doughtya vice president of technology at Blade, a consumer-technology foundry, says he’s confronted with too many opportunities to tip. “I have enough trouble navigating the tip waters in generally well-understood situations that I don’t need new ones cropping up,” he said. At George Howell Coffee in Newton, barista Jon Lee, 22, says he hates the “awkwardness” of the tip-or-no-tip moment. “I don’t want them to think I’m expecting anything of them,” he said after the afternoon rush on Monday. Lee says an individual customer’s one dollar tip doesn’t make or break his day, but, at the same time, the gratuities do add up. Last week he earned $160 in tips — money he’s using to help save for college. “It’s huge,” he said. Tip creep is occurring as a growing number of people are questioning whether tipping should go the way of the spittoon. The argument goes that higher wages — not tips — are the key to a sustainable service industry model. Josh Sturm of Brookline left a dollar tip for his cup of coffee at Barrington Coffee Roasting Company in Boston. The countertop technology doesn’t drive up gratuities through guilt alone. The systems’ preset default tip options tap into the power of suggestion, sometimes pushing tips into the 50 percent range or higher. Some math-phobic patrons are happy to give a bit more if it means they don’t have to do any calculating. And the ease of using a credit card rather than cash reduces the pain of paying. Digital payment systems are relatively new, but taxicabs have been using machines with preset tip options for years, and research on an immense data set — 13 million cab rides taken in New York City in 2009 — found that the higher the preset tip choices, the larger the tip — up to a point. For rides above $15, the preset default tip options in about half of the cabs were 20 percent, 25 percent, and 30 percent, while the preset default tip options in the rest of the cabs were 15 percent, 20 percent and 25 percent. The higher default led to bigger tips — more than a 10 percent increase, or up to $600 a year extra for the cabbie, said researcher, Giovanni Paci, a post doctoral student at the Institute for the Interdisciplinary Study of Decision Making at New York University. But, Paci noted, rides with the higher tip suggestions were more than 50 percent more likely to result in no tip at all. “It’s a backlash effect,” he said. He speculated that customers may have been penalizing drivers for using default amounts that seemed unfairly high or manipulative. 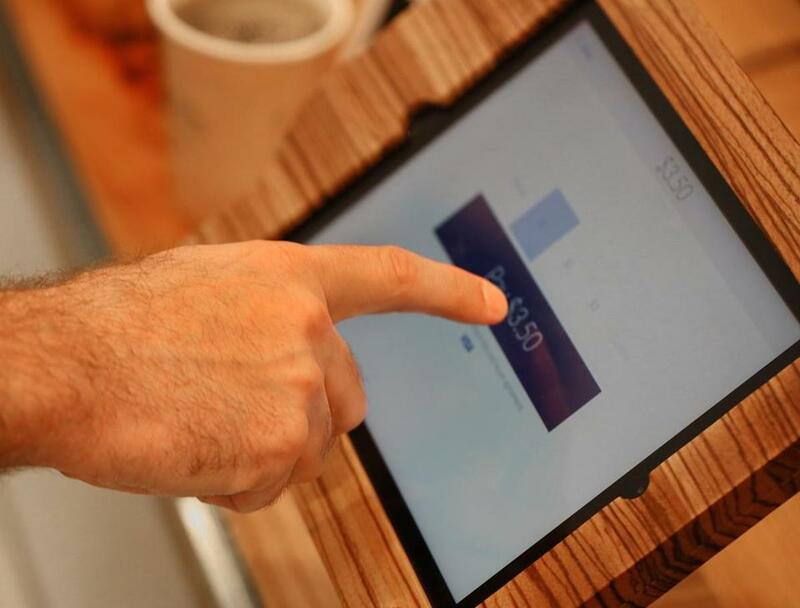 In Boston, the fear of backlash prompted Avi Shemtov, the owner of The Chubby Chickpea food truck, to instruct employees to use a workaround to avoid confronting customers with a tip screen on the tablets. This being America, the backlash has created its own business opportunity: it’s DipJar , a tip jar for credit cards that sits on a counter and lights up and makes the sound of clinking change when a customer inserts her card. Meanwhile, back on Newbury Street at Barrington Coffee, manager Brittany Lajoie worked the shop’s $20,000 Steampunk coffee machine, and offered a glimpse into the psychology on the other side of the tablet. “I like to intentionally look like I’m not looking,” she said. 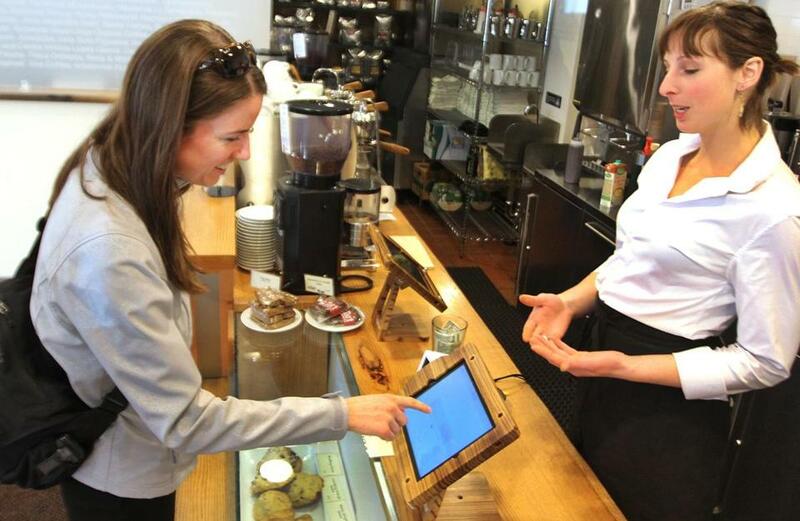 Manager Brittany Lajoie looked on as customer Ailis Tweed-Kent used an iPad to pay for her large latte at Barrington Coffee Roasting Company in Boston.